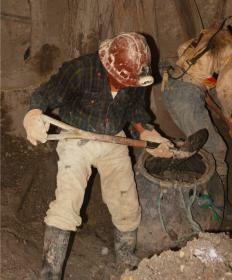 Mine managers often have experience working as a miner for the company before being promoted. You will typically need a minimum level of education and at least some mine experience to become a mine manager. Most employers require mine managers to have bachelor's degrees, at minimum, and many prefer job candidates who hold degrees in engineering-related majors. You will likely need substantial experience to land this job as well, such as a history working in a mine, which may including internships. Additionally, you will typically need a range of skills, including those related to leadership, communication, and mathematics to land this job. As far as education is concerned, you will probably need a bachelor's degree to become a mine manager. For example, you might land a mine manager job with a degree in engineering or a related subject. Such education will likely give you the knowledge you need to help ensure that mine activities run as smoothly and safely as possible. You can, however, give yourself a competitive edge against other job applicants if you choose to earn a master's degree instead. In addition to education, you will usually need experience when you want to become a mine manager. Many employers prefer to hire individuals who have significant experience working in a mine. In lieu of getting such experience through paid employment, you could also seek internships that provide you with related experience. Many people work their way up from other positions in a mine to become a manager. Building your knowledge in specific areas also can help you become a mine manager. For example, you will likely need knowledge of a range of engineering and technology concepts to succeed in this job. You will also need knowledge of design principles and tools as well as advanced math topics, such as algebra and geometry. Additionally, you might need some knowledge of production processes, raw materials, and legalities that pertain to mining. There are many skills and abilities that may also prove important when you want to become a mine manager. For starters, you will need good communication skills and the ability to work on a team as well as to lead others. You will also need good reading comprehension and writing skills as well as the ability to think analytically and problem solve. In addition to problem-solving skills, you will also need to be capable of sensing or predicting when problems may develop, so you can respond to them before they become serious issues. Other skills that may prove important include those that involve organization, estimation, and computers. Typically, you will need good organizational skills as well as the ability to pay close attention to detail. The ability to easily estimate distances, sizes, and weights also can prove helpful in this position. Additionally, many employers will expect you to have experience using computers and various types of software. How do I Become a Mining Engineer?